Root fractures account 0.5-7% of all the dental traumatic injuries, with only 5% incidence in mandibular incisors. Management of horizontal root fracture presents a formidable challenge for clinicians because of the difficulty of achieving a stable reunion of fractured fragments. Achieving stable fracture reduction is inversely proportional to the severity of dislocation, mobility and pulpal injury. Extraction and replacement is the treatment for severely mobile teeth. Endodontic intervention is required for non- healing fractures. 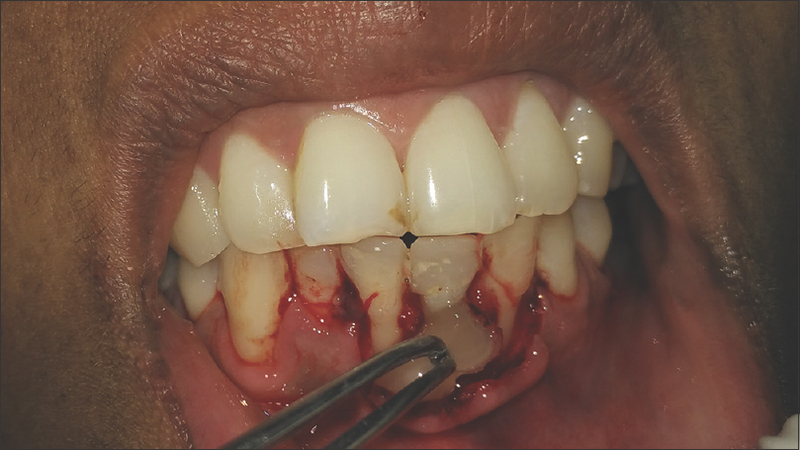 This case report presents a successful surgical retreatment of horizontal root fracture of a mandibular incisor using fiberpost. The fiberpost, as intra-radicular splint, represents conservative approach for treatment of horizontal root fracture rather than succumbing the tooth for extraction. Horizontal root fractures are common in middle-third of the root, are 5% in mandibular incisors, and result from the forces which effect compression zones labially and lingually and separate the root into coronal and apical fragments. The initial treatment is the repositioning of displaced coronal segments, followed by stabilization. The amount of dislocation and the degree of mobility of the coronal segment affect the prognosis. Endodontic intervention is required for nonhealing fractures, and intraradicular splint use was suggested by Weine et al. No treatment guidelines are present for the teeth with severe mobility other than extraction and replacement. 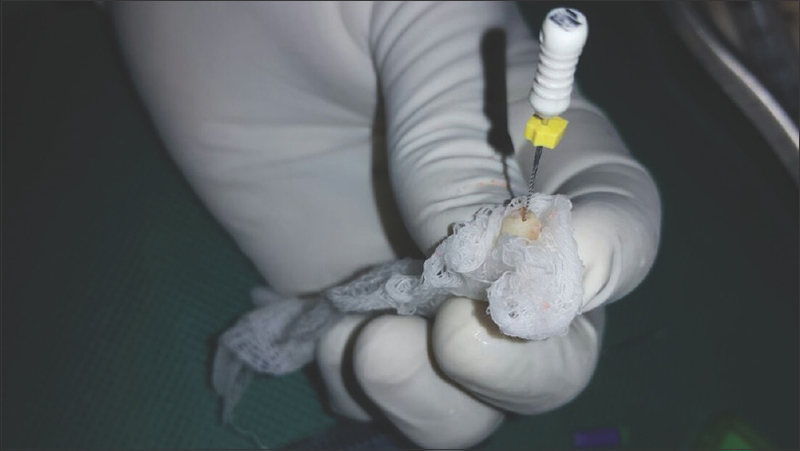 The aim of this article is to report successful management of horizontal root fracture using fiberpost, platelet-rich fibrin (PRF), and G-graft. A 35-year-old female patient reported to the Department of Conservative Dentistry and Endodontics with a chief complaint of pain in her lower front teeth. She gave a history of self-fall, hitting her chin, 2 months ago, following which she had undergone root canal treatment at a private clinic but continued to experience the pain at the same site, for which she was recommended to our hospital. Clinical examination revealed Ellis Class III fracture in 31, 32, 41 [Figure 1]. 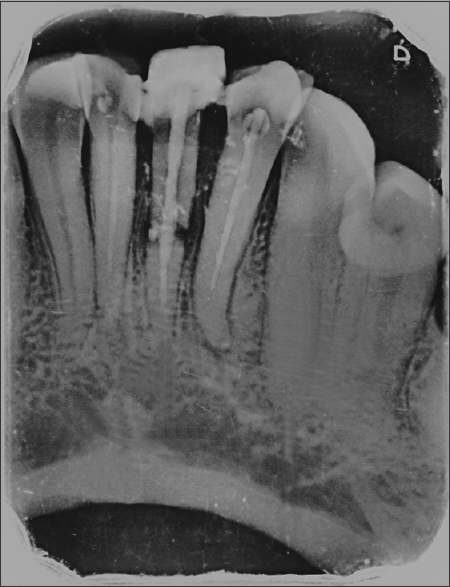 On palpation, tenderness with mobility was elicited in 31 and radiographic examination revealed unsatisfactory root canal therapy in 31, 32, 41 and transverse radiolucency in 31, suggestive of horizontal root fracture [Figure 2]. The patient was explained about the condition and the treatment plan, objectives were discussed, the patient was motivated for the same, and the importance of maintaining oral hygiene was explained. The main aim of the treatment was to restore the tooth back in form and function through retreatment of the concerned teeth and achieving stability surgically, through intraradicular splinting using fiberpost. 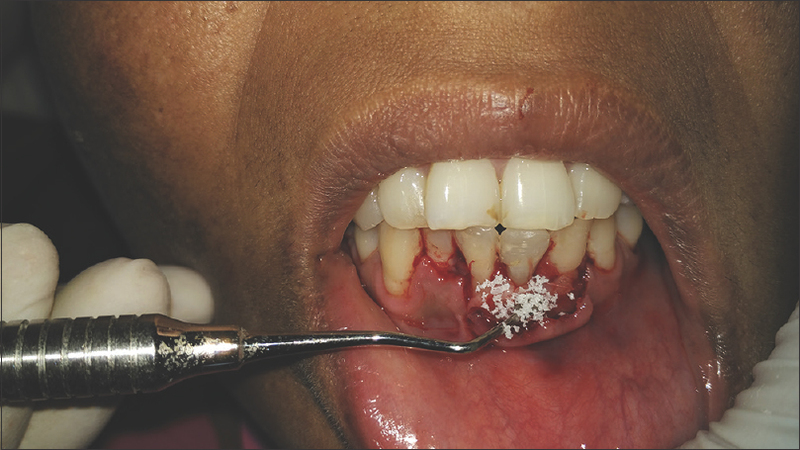 On obtaining the patient's consent, oral prophylaxis was carried out and followed by endodontic retreatment irt 31, and the gutta-percha cones were retrieved [Figure 3]. A horizontal flap was then reflected irt 31, 32, 41 [Figure 4] and the mobile coronal fragment was gently removed. Working length of the apical fragment was determined and was enlarged up to 2% 35 size and obturated with gutta-percha, 2 mm short from the coronal end. 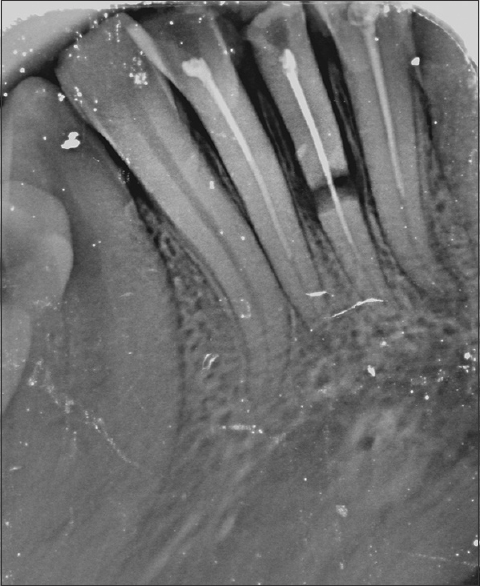 The coronal fragment was held in a wet gauze, and the cleaning and shaping was carried out to 2% 45 size [Figure 5] followed by enlargement with Gates Glidden drill (Mani Inc., Tochigi, Japan) to size #3 and post space preparation using Peeso reamers (Mani Inc., Tochigi, Japan) to size #3. The teeth irt 32, 41 and the post space of the coronal fragment irt 31 were etched, rinsed, and dried, and a fiberpost (Tenax Fiber Trans®, Coltene Whaledent Pvt Ltd., Cuyahoga Falls, Ohio, USA) of diameter size of 1.1 mm, used as an intraradicular splint, coated with dual cure resin (Para Core ®, Coltene Whaledent Pvt Ltd., Cuyahoga Falls, Ohio, USA) was inserted into the post space and was placed onto the apical fragment with slight digital pressure. Composite buildup was done irt 32.41 using nanohybrid composites (Tetric ®-N-Ceram, Ivoclar Vivadent, Schaan, Liechtenstein). PRF and G-graft (G. Surgiwear Ltd, Shahjahanpur, India) were placed at the exposed site (site of fracture) [Figure 6] and [Figure 7], and the flap was repositioned and sutured [Figure 8]. 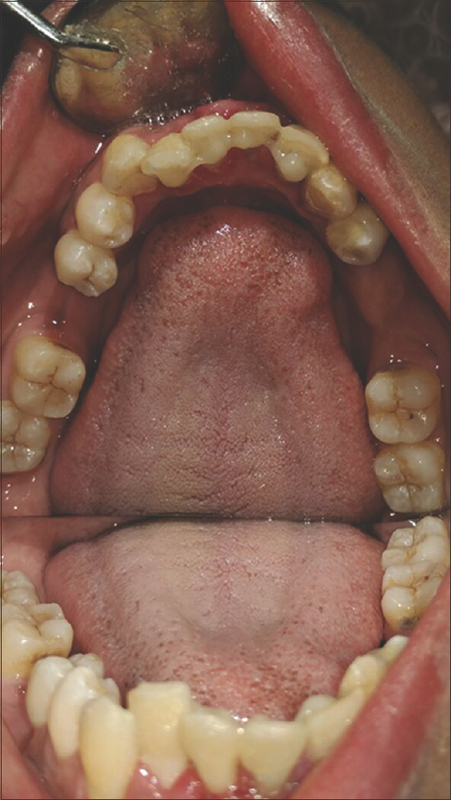 A lingual composite (Tetric ® Flow, Ivoclar Vivadent, Schaan, Liechtenstein) splint was given irt 31, 32, 41 to stabilize and achieve reduction in the mobility of the fragments irt 31 [Figure 9] and medication was prescribed. 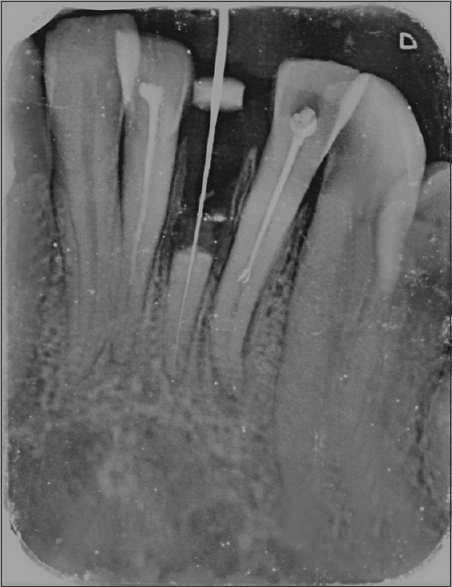 Root canal therapy was completed at later date in 32,41 and was reviewed at 1month [Figure 10], 3 months [Figure 11] and 6 months [Figure 12]. Preservation and restoration of the teeth to its form and function is the primary goal of dentistry. Extraction and subsequent replacement with osseointegrated implants can be a treatment option, but with the availability of fiberpost, a conservative approach for treatment of horizontal fractures can be attempted as supported by Gurtu and Singhal. Interproximal inflammatory tissue without healing. Radiographically, a widening of the fracture line and/or a developing radiolucency corresponding to the fracture line become apparent. 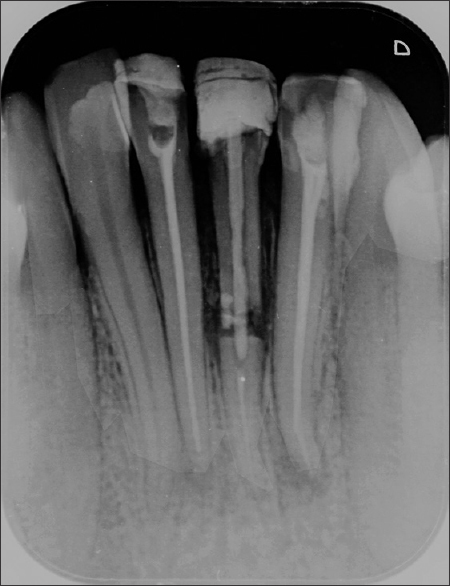 The healing in this patient was found to be with interproximal bone and connective tissue. The use of post allows achieving stability of the tooth. Here, a fiber-reinforced post was used as it has been reported to exhibit high fatigue strength, high tensile strength, and a modulus of elasticity closer to dentin. Furthermore, the fracture site was surgically exposed to accurately reposition the fractured fragments and PRF prepared from patient's own blood was placed with G-graft containing hydroxyapatite and collagen granules, as PRF accelerates wound healing and allows regeneration of tissue, thus resulting in faster and better healing, and G-graft acts as an osteoinductive material. Splint type is an arguable factor in the treatment of root fractures. Andreasen et al. stated that the type of splints appeared to have no association with the healing outcome. For the immobilization of traumatized teeth in the present case, we preferred to use composite splint, to enable physiological mobility. In our patient, there was mobility of the traumatized tooth at the end of the 2nd month; therefore, a prolonged duration of the splint was considered safer and more viable for healing as stated by other studies. There were no signs of mobility or pathological symptoms at the end of 3 months. 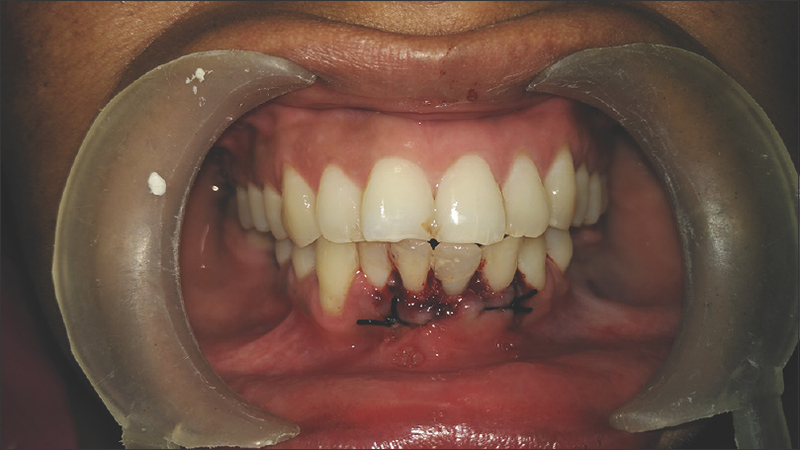 The case shows favorable results using the post as intraradicular splint, exhibiting healing with interproximal bone and connective tissue, and represents an effective treatment modality instead of succumbing the tooth to extraction. 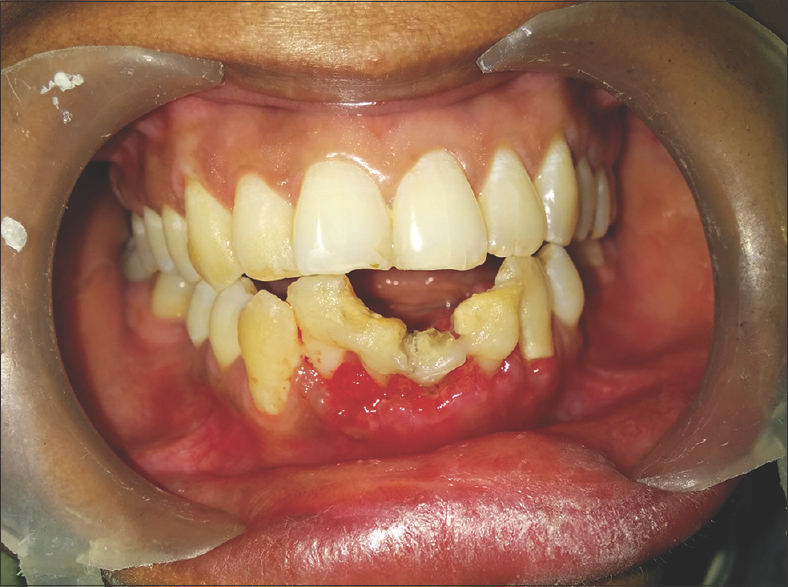 In other words, under the condition described in this case, a conservative approach should be attempted before considering the tooth for extraction. The prognosis of root fractures depends on understanding its biological concept of the root fractures and the knowledge of the availability of materials. Welbury R, Kinirons MJ, Day P, Humphreys K, Gregg TA. 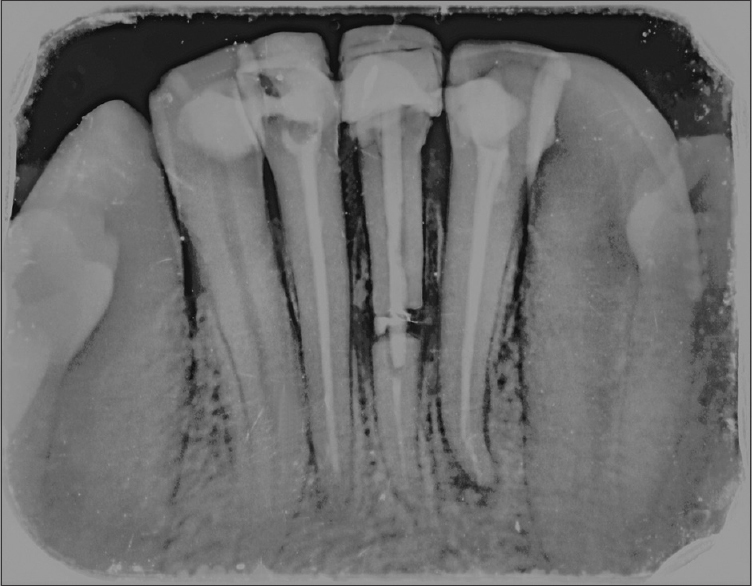 Outcomes for root-fractured permanent incisors: A retrospective study. Pediatr Dent 2002;24:98-102. Andreasen FM, Andreasen JO. Root fractures. Textbook and Color Atlas of Traumatic Injuries to the Teeth. 3rd ed. Copenhagen: Munksgaard; 1993. p. 279-311. Jacobsen I, Zachrisson BU. Repair characteristics of root fractures in permanent anterior teeth. Scand J Dent Res 1975;83:355-64. Weine FS, Altman A, Healey HJ. Treatment of fractures of the middle third of the root. ASDC J Dent Child 1971;38:215-9. Gurtu A, Singhal A. Management of horizontal fracture. J Dent Sci Oral Rehabil 2012;3:48-50. 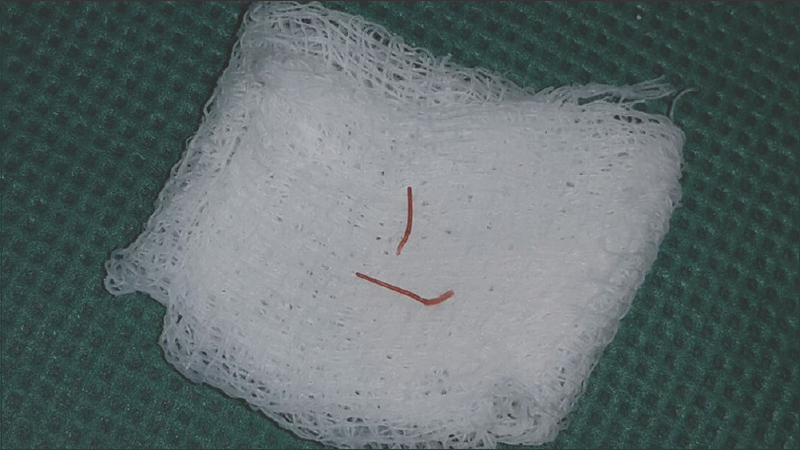 Bansal P, Kanyal K, Nikhil V. Surgical management of horizontal root fracture with platelet rich fibrin placement: Case report of two cases. Dent J Adv Stud 2014;1:28-31. Nandi SK, Roy S, Mukherjee P, Kundu B, De DK, Basu D, et al. Orthopaedic applications of bone graft & graft substitutes: A review. Indian J Med Res 2010;132:15-30. Andreasen JO, Andreasen FM, Mejàre I, Cvek M. Healing of 400 intra-alveolar root fractures 2. Effect of treatment factors such as treatment delay, repositioning, splinting type and period and antibiotics. Dent Traumatol 2004;20:203-11. Flores MT, Andersson L, Andreasen JO, Bakland LK, Malmgren B, Barnett F, et al. Guidelines for the management of traumatic dental injuries. I. Fractures and luxations of permanent teeth. Dent Traumatol 2007;23:66-71.